It is always important to start with definitions so that we eliminate misunderstandings to the extent possible. Pork (noun) discretionary spending by elected officials. Protest (noun) a public gathering advocating for a position, usually a change from that which now exists, or against an act, usually perceived as bad. Insane (noun) people who do not behave normally. Asylum (noun) a gathering place for people who do not behave normally, generally under the supervision of people who do behave normally. Trust that the individual receiving delegated responsibility will be judicious in handling it; training and prior experience are elements used by people to establish that they are trustworthy. Oversight, or checking by the boss that things are being done right. Punishment or promotion based on how well delegation is handled. Delegation of authority is the fuel that empowers productivity. It prevents the company or organization from getting frozen by indecision and delay waiting for the boss to act before things can be done. To think that an organization as huge and complex as the Philippines can work effectively without delegation is certifiably insane. Who are the normal people? In the Philippines, because it is a democracy, the normal people running the asylum are voters. The asylum is the whole of the government extended to include people who try to influence government between elections. Protest groups are an extension of government in that respect. They are one of the checks and balances. Both legislators and protesters operate within the asylum. These groups are not the bosses, although they may talk like they are, and they may want to be. They are not the normal people. They have been delegated certain tasks or responsibilities, that’s all. They have things to do. Pork is money entrusted to public officials to facilitate their work. Nothing more. THE MAIN PROBLEM in the Philippines is that there is a lack of voter trust of public officials, occasioned by a great deal of ripping off of the public by aforesaid public officials. Not only that, but oversight is poor. There is no FOI to let the normal people, the bosses, the voters, figure things out, or to help protesters understand what they are protesting about. Lacking good information, they protest what they THINK is the problem. That is, they believe the rumors and speculations spread by others, and they believe – that is, TRUST – the pronouncements of the protest leaders, most of whom . . .
were not elected. . . The problem is that the protesters usually think their way is the right way, the best way, the only way. That’s why they are in the asylum. It is a certifiably insane presumption. Finally, in our asylum of government process, there is precious little punishment for people who wield their responsibilities badly or criminally. So the guilty never get to the point where they receive a bad result for bad behavior and actually FEEL remorse. Mostly they feel angry that they got caught. I mean let’s be blunt about it. If you ever were to decide to look inside a real psychiatric asylum, and then looked at the Philippine system of justice, you’d see the striking mirror image of behaviors: adults staring at blank walls and talking at lamp posts and wetting their pants. Democratic process is the normal process. It allows every qualified person to speak, to have input by casting a vote to direct how the nation will be run. Protest groups such as the anti-pork crowd abide by a different set of principles. Members of the rally give their voice to leaders who are not formally elected. They surrender it. And those leaders use that voice as leverage to call for crazy things like eliminating all discretionary spending or REALLY bizarre acts like ousting the President of the Philippines. It is rather like selling a vote, or letting someone else cast it. The odd thing is that it empowers the most extreme of the leaders. You think you are empowering elimination of pork and all of a sudden some yahoo is using it to impugn COMELEC or bring down the government. That’s what happens if you release your vote or sign a petition that people will use as THEY want, not as YOU want. Why do people surrender their vote? It allows them to feel they are being a part of an active solution. A regular vote is not good enough. Not powerful enough. Besides, we can’t wait until the next election. We want change NOW! Well, it’s no wonder that people go tripping down the path of the loons. They find that the world surrounding them is full of frustration, confusion, and dismay. The tabloid Philippine press makes sure we all feel the misery. So in those terms, I sympathize with the protesters. The asylum itself induces craziness if it is not properly managed, or is out of control. Rampant corruption and poor work done by entrusted officials in the Philippines would drive the best of us nuts. “Reader, suppose you were an idiot? And suppose you were in Congress? But I repeat myself.” Mark Twain, American author and outspoken advocate for Philippine Independence. The Philippines is notorious for punishing itself. It is like a nation sitting in the corner and pushing pins through its fingers. But look at where the nation is now, thanks to the stability brought on by the Aquino Administration. Rising in the global ratings, rising in financial stability, rising in reputation and economic strength, investing in infrastructure like no prior administration, striking out for peace in Mindanao and with China. So many good deeds. And the main reason for the rise of the Philippines? What do large protest rallies, hyped by a sensationalist press that magnifies the significance of these outlying thinkers, project to the outer world, and bring to the inner Philippines? “Oust the pork king!” Emotionalism calling for solutions outside the established order. Still longing for coups after all these years. Emotionalism, unrestrained, detached from pursuit of normal behaviors . . . like stability and progress . . .
Pork is not the problem. And lack of good information. And a court system that does not punish. And nepotism in hiring and promoting that removes competence from the system. I’d suggest we would be better off working NORMALLY within the system to influence our representatives in Congress to take care of these problems. Bills are already on the table to address each of these issues. Help move them along, as voters sane of mind and deed, speaking through the officials to whom we have delegated responsibility. Follow up with our representatives. How did they vote? What legislation are they putting on the table? Are they pushing . . . or following ? Our democratic obligation is to be good bosses within the organizational system. Not lunatics, working against the stability and well-being of the Philippines. * I of course exaggerate to make a point. I think 90 percent of the protesters are of honorable intent and legitimately frustrated with corruption and incompetence. And protest is a freedom, a force that can provoke responsible deeds in some circumstances. But now is not the right time, or the right circumstance. PDAF and DAP are dead. The system is working exactly as it should. Democracy is not a dance in the moonlight. It is a crunching, grinding deployment of argument with absolutely no requirement that things be done “our way”. I’d guess that the protesters have probably not read the entire anti-pork initiative or figured out how impractical or unnecessary some of the elements are. They also have not found comfort in the Supreme Court rulings or changes of procedure that have already been implemented WITHIN the system. Their lack of earned trust in the system is squarely a fault of political leaders. Legislators need to strive to be less Mark Twain’s “idiot” and more the courageous patriot. I would also guess that most protesters have never worked in a “boss” role in a corporation or military establishment to understand how critically important delegation is, in concert with good information, good supervision and good punishments or promotions. The people I most heartily object to are those who would seek to destroy the system by calling for the ouster of the President when the system is more stable today than it has ever been. I object to the truly lunatic, self-designated leaders who seek to destabilize . . . be they commies or priests or lawyers, strange fellows who don’t mind sharing a bed if it helps achieve their narrow aims. Well, down with them. And . . .
Up with pork, and its partners, information, supervision and punishment or promotion. Down with crooks and those who would sacrifice the nation for their private interests. Up with stability and working within that stable system. Try this idea on for size. If you want to feel a part of the Philippine rise to world prominence, work to stabilize the nation instead of promoting trivialized unrest, like impeachments of no merit, people’s initiatives that are not necessary, and destructive “oustings”. Work passionately within the system for better results. You’ll feel accomplishment with each stride that the Philippines takes. ← What is the Inquirer’s game? I just posted the following comment on the other thread (about Inquirer) but I think it should also be relevant to the current topic as it shows how the pork protests are played up by some of the media outlets to suit a particular agenda. I hope ypu don’t mind if I repost here. Wonderful analysis. This is what we need to do, hold newspapers up against one another. Quality will rise and the Manila Standard will go away. Thanks for the objective comparison. The words speak for themselves. I shook my head at Philstar’s attempt to explain the low numbers with “protest fatigue” (given that the same group of protesters are really the only ones that’s been at it for a while anyway). Manila Standard’s “Anti-pork bid catches on” had me shaking my head and smirking. By the time I got to Manila Times’ “spirits high”, I just cracked up. But I wasn’t really expecting much from those two in the first place ( and even from Philstar). Rappler, and Interaksyon are more the disappointment. Any old excuse to explain a flop. I look at it positively. About 99,995,000 Filipinos did more productive things. Definitely pertinent to both blogs. Thanks for the repost. This is great. I will repost this. This is a very good exercise! One of these days I will do one on Ayee Macaraig’s body of work. Ever since Joeam wrote on her SONA news analysis, I have been checking on her writing and have noticed something interesting. Maybe when Joe writes a blog about media people again. Just listened to Kompre on Karen Davila on ABSCBN, it is a group supporting the reforms of the President. Supporting a second term for “Matuwit na daan” but not for Pnoy. The reform glass being 2/3 full, so they look at how to assure we don’t lose what we got and how to fill it up even more. How to communicate the 2/3 realized better. How to cascade to all local levels. Reading about yesterday’s march, I’m optimistic. It is clear that people stayed away because they saw that the anti-pork movement is highjacked by the real sick and “insane” as the bishop with a large crucifix on his belly. Original anti-pork was anti-corruption opportunities, anti-patronage opportunities, now it is just plain anti-Aquino. But aren’t most of us insane is some areas? Or in some situations? Or some of the time? Or just a little bit? Do you have to agree with all the statements in a rally, all the motives or is 90% aligning with your ideas OK too, or just 50%? Or is only keeping the discussion going enough? We are all a little bit insane, and if I were a rock lyricist, I’d put that to a catchy beat. And, indeed, the failure of the program to inspire passion says a lot for the common sense of a whole lot of Philippine citizens. If this is not an insane system we are in, why do those people keep on voting for politicians whom they know are corrupt? Those who enjoyed the pork should not be blamed because they know how mad and insane they are for the pork and yet they were insanely given the chance to partake of such insanities again and again. Those leaders of those insane protests mostly do not understand what they are hoarsely shouting for. Those who used their porks to fatten their bank accounts (because the amounts are too big they would not fit into their pockets) are already known but there are those who used their shares to benefit their constituents wisely and honestly. There should not be a wholesale condemning of the porkers since there would be people who’d be severely affected with the total scrapping of the pork, like those poor, sick indigents and scholars who could not go on with their studies. This insanity is bound to go on and on when we will not come to terms with ourselves that we are the primary cause of this insanity and we do not want to look for remedies to stop this madness by wisely choosing honest and incorruptible public servants who would do his/her work without thought of any reward, materially or otherwise. Yes, it seems like the loud are wagging the agenda. I can’t figure out what in the world they want a people’s initiative for when the system is working working working on the pork problem. And the impeachment complaints that take legislative time away from real work. I mean, why should Pacquiao deal with impeachment when he could be doing his . . . um . . . um . . . oh, yeah. He’s in the US training. Nevermind. Totally agree with you gerverg1885. These leftists in congress want to abolish everything pork without suggesting what to do with those sick indigents and scholars. They claim to be for the masa and yet seem to be so far out of touch with the realities the poor have to face. I hope these recipients of honest pork rally against these leftists. These leftist who know only to rally should be made to taste their own medicine. As a card-carrying insane Filipino, I joined last year’s Million People March. Obviously, we didn’t add up to a million people. The message was clear: get rid of that infectious, tainted pork and put guilty people behind bars. However, I refrained from joining the march to Mendiola. My First Dan white belt of crazy wasn’t sufficient to join the 9th Dan red belts there. I have no plans of seeking a color upgrade. Anyway, difference from last year and today: People were more “angry.” Like, that was the peak of the PDAF scandal. I had no plans to join yesterday’s mass protest. As you said, and as the SC ruled, both PDAF and DAP are “dead.” I guess I am a more forgiving protester. My other convenient excuse for not going is it’s my turn to do the laundry and the cooking. Anyway, I do believe that there’s always a period of moving on and corrective action. I understand that a big government isn’t like a basketball point guard that can immediately shift directions. Personally, I like the idea of having people vocal about issues as long as they are justified, or there’s no reaction from government. You have to thank the SC for coming up with those lame decisions on PDAF and DAP. Those certainly helped in pacifying the crazies in my segment. In my head, at least the admin didn’t really these issues “sweep under the rug.” Damn. The Philippines is serious at this Democracy business! I love pork, but only as chicharon, inihaw, barbecue and sinigang. My college professor always praised the pig for the high carcass utilization. The congressional pig for the pork barrel is a different story, imho. I would love to read a study on the economic benefits of this now-dead mechanism. Maybe you have research or a link for that? How much impact can traditional pork really create? What metrics do pork supporters use to claim that it is beneficial? As you mentioned, there’s lack of oversight, no FOI, no nothing that can make people who work/play with it truly accountable. Can one truly measure and manage pork barrel spending and impact? Isn’t the end beneficiary the one who spends it? Future votes are also benefits, right? I’m glad congressional pork is dead. Lets keep it that way. Oh, and kindly ask gov’t to put more behind bars. Please move the other cases. I thought there were more implicated? I thought there’s more that just a Janet Napoles? Where the heck are those people? As a side thought: not to give former PGMA some breathing room here. Her administration could be a textbook case on the negative impact of too many protests and having a government that lost the trust of its people. You may be insane, but you are wise. So that’s a good balance. And having to cook and do laundry is for sure a good reason not to go out and listen to political speeches about dead pork. The metrics you cite that I believe should be used to measure the whole of government’s deeds are GDP growth, manufacturing growth, and average personal income levels. Maybe one or two others. If those are going gangbusters, man, keep tossing pork freely and make other investments you (you being the President) believe are important. If they aren’t, then I want to see where you are spending your money. There are conflicting reports on how much the pork added to GDP growth. I think Abad puts it at 0.7% of the 7% growth, or somesuch. Really knowing takes some digging, I think. PCIJ did a series of articles about pork. Maybe they commented. I don’t have readily available links. This year’s protesters define pork as any fund whose dibursement is discretionary upon whoever is in control of the fund. It is obvious from this definition that the protesters who went there, the priests, nuns, leftists, students have had no experience in running an organization, whether big or small. Anyone who has had experience in managing would know that discretionary funds are an indispensable tool in running an efficient and effective organization. Exactly. “Pork” has become almost a swear word, the negative stigma is so heavy. But discretionary spending can be good or bad depending on how it is used. It has been used well, and used badly (corruption). The focus should be on the processes that promote better management of HOW it is used. That is, transparency and supervision. Not tie the hands of government in red tape that slows good work and makes it hard to take care of people. Interesting observation. I guess all lump-sum funds were given an “evil” tag. Personally, I won’t blame the protesters. After all, it was those bad eggs that ruined the entire gig. I can blame the institution that didn’t police its members well enough. Too many years of mutual backscratching in government, if you ask me. In corporate settings, how would you define “discretionary”? I won’t be too quick to say that it is efficient. It could be effective, but not efficient. I’m not a big fan of throwing money at problems. I for one will be pleasantly surprised the day the Philippines finally becomes honest with itself (another shocking, stunning non-probability here) and drops all pretenses to the concept of democracy. For the most part–at least in terms of numbers–we are 21st-century feudals, unfortunately, no happier than when we are surrendering the heinous responsibility of choice and shirking the debilitating weight of empowerment in favor of our singing, dancing, “pamburol”- and “pambinyag”- (“for funerals” and “for baptisms” respectively) dispensing overlords. Too many of those rallying yesterday don’t want democracy. They just want to be the overlords for a change. Per usual, too many chiefs and not enough Indians here. No wonder “democracy” is so alien. For a bit of hope– I still presume this situation could be improved through a massive improvement of our education system, public and private. Sadly, not only would this seem to require a huge governmental adjustment, this would also require a giant psychological and intellectual adjustment of educators, private and public. I’m not so sure that’s at all possible. But maybe, under some near-miraculous alignment of circumstances, baby steps could be made. We can only wait and see. I’m not sure where Dep Ed has their skullcaps. Education could do so much for the Philippines but they wage the fight with underpaid teachers who can’t do it with 45 kids per classroom. I tell you, going to internet teaching, starting with high schools, would upgrade the quality of instruction across the land. But the nation is not that kind of bold I think. Next year is just a repeat of this year. Bingo. You got it. By the way, that was my favorite line in the article. I do think President Aquino has put some good disciplines in place regarding planning by the numbers and measuring progress, including measuring local competitiveness. Those discipines, if perfected and continued, would eventually chase the sloth and inefficiency and incompetence out of the system. The big uphill battle here is to bring the poor into the political process so that they engage to benefit, rather than penalize, themselves. That’s a tough one. The stench of private interests was certainly arising from the protest fields . . . I have a nasty suspicion that many of the pork protesters, and by pork protesters I mean the do-gooders not those from the permanent opposition, do not really bother to study the issue. If they are too busy to dig through and analyze primary source documents, then maybe they can at least browse docs that seek to explain certain meaningful reforms before they go out on the streets dressed as pigs in blonde wigs or as holy men with giant crosses resting on their pro-poor pot bellies. Yes, there you go. Exactly. Now I’d like W. Bello’s reconciliation of his call for Abad to resign, with this article. I don’t get why the one person who GETS management by objectives and accountability is the one that protesters presume does not get it, and they further presume he is running wild with the people’s money. And I have yet to hear ANYONE say that they would do anything different than what Abad/Aquino did, given the choices of: (1) continuing to invest in Arroyo’s corrupt and ineffective projects, (2) return the savings to treasury and let the economy languish, or (3) spend the money to better purposes and build the economy. I’d bet every SC justice who put in the same predicament would have done exactly as Abad/Aquino did. Maybe different projects. But the same basic thing. Bello would have, too. I saw the memo of Butch Abad to the president re: Bello’s call for Abad to resign or be fired. It answers Bello point by point. I don’t know if DBM will publish the reply of Abad but I hope it does so and soon because it reveals how totally baseles and uninformed Bello’s call is. Thanks for the update. It would be a shame for Bello’s take to be the one left in people’s minds. If only the President’s subalterns, those people who touch the grassroots often (the MRT crowd, the poor in the provinces, the farmers who have no farm to market roads, the police and military establishments), if those executive and legislative leaders will only shape up and do their work for the people, then all this PI will be of no effect. OR it could be too much bingo. Just saying. @Killer, that’s what I thought too when I saw that piece of Doris’ interview. But coming from that perspective myself, those people really can’t do much because of lack of opportunity to earn. The national leadership should really go to the barangay level, give projects that will positively impact the lives of these bingo-loving people, and of course, we know that even at the barangay level, there is corruption. I for one have been in a discussion with a barangay treasurer from the Visayas and a barangay secretary from NCR and they both confirmed through their stories about the “contractors” making money through the projects their local government is investing in the barangay level. So there ought to be some form of barangay level anticorruption drive in there too, not just in the national level. I hear you, BFD. The National Government’s job is to institutionalize reforms against corruption; these installed processes are then to be spread throughout the bureaucracy–all the way to the most basic units. Having said that, I agree with your call for an anti-corruption advocacy to be carried out in the Baranggay or even Sitio levels. Thing is, this has to be either self-driven or initiated by a higher but relatively closer government unit. This just makes things possible and easier. That Malacanang implement a grass-roots goon clean up in the smallest baranggays of the smallest towns is just too big an ask. Oddly, the SC decision on DAP impelled the Administration to stop a project aimed at relocating poor people living on dangerous riverbanks. Those people will have to live there until the funding for the project jumps through some additional hurdles. Also, if you look at the Aquino budget for 2015, money for social programs is on the way up. The problem is that the breadth and depth of poverty is just overwhelming, and the babies keep coming, each with an appetite. Also, the investment in infrastructure is 3 times Arroyo’s peak year, so there is sensitivity about MRT, but you can’t do everything in a year. Or 4. Maybe 15 or 20 works. I agree sir.you cant do everything especially with people when you are going to the rigth,they are hoing to the left if you are going to the left they are going to the rigth.Filipinos complain too much but in action,nothing. Who really rules the cuckoo’s nest in the Philippines? 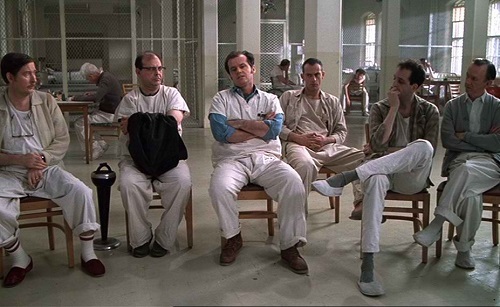 I do not see President Aquino as Nurse Ratched, rather he is more like McMurphy. He often swims against the tide with his reforms. You say the voters are the one that run the asylum. The President affirms that the masses are his bosses. What can be done when these so-called proponents of democracy make a mockery of that principle by perpetuating the very same evils (family dynasty, corruption, political patronage, etc.) that negate it? That’s called “character”, ahahaha. Jail the buyers. Education. PR. Long term effort to instill conscience. Lobotomies. Pautot lang sila.Mostly they are corrupt. Like the bishops,Bacani,during erap time did he admonish erap regarding his corruption?No because he was his benefactor.The suv bishops asking gifts to gma instead admonishing them they depended them galit pa sila kay pnoy. The Catholic Church is an organization without an organization, so individual priests can be outspoken and political or hold hands with the corrupt, and there is no one to counsel or correct them. All is forgiven. So we get a mix of good behavior and bad from the priests. I think it is hard for the Church to progress when so many of its members hold it back with outrageous political behavior. They even ignore the Pope’s pleas. Joe, this observation is such a profound one that it is a key insight into why the Catholic Church is so often, often misunderstood. Allow me to annotate your statement for my benefit (primarily), lest I forget. 1) “The Catholic Church is an organization without an organization,” Any well-catechized Catholic will give you a knowing smile if he/she hears you say this. For my part, I will cry out and say she is and has an organization. She is an organization. par excellence, with one totally distinctive characteristic – her members have the ear of the CEO, in ALL matters, 24/7! 2) “…so individual priests can be outspoken and political or hold hands with the corrupt, and there is no one to counsel or correct them. All is forgiven.” These agents of the CEO operate with faith, obedience, and free will, and SHOULD communicate in total transparency and accountability.They operate at extreme peril if they operate otherwise. See #2 especially. The military standard of carrying out a command is but a derivative of the priest’s (good or bad) obedience to his directives. There is an unusual quiet in the Legislative branch about the Binay parking lot fiasco. Aside from Cayetano, Trillanes and Pimentel who are sticking their necks to get the real story out, and Ejercito and the Binay children crying foul, one can hear a pin drop in the usually rowdy and opinionated legislative branch… What gives? That is interesting. Plus some committee members declined to even show up at the parking garage senate hearing. I think it has two facets. First, the “evidence” is very general (the price of the cakes being a guess, for instance) so there is not enough there for them to state a position on. And second, Binay is the front runner for the presidency, and they will be quiet until they are assured he tilts to “unlikely” to be president. That latter point suggests that the legislators do obviously get favors from the president, and will continue to curry those favors, pork or no pork. Only Trillanes and Cayetano are overtly running for president at this point, so it’s their careers, no matter what they do. So attack makes sense. Every view of the maker of Peoples initiative (is it from the people or from the REDS?) is almost the same judgment, it’s from the REDS. They are like animals from the zoo waiting to find an opening door and attack the weaklings. How could the REDS, called it Peoples Initiative (PI) when it did not voted by the majority of the Filipino Democratic mind? The icon you provided jacketed men or say ward#1 in NMH (National Mental Hospital) are needing their dosage to calm down their vision are exactly what they are doing right now. They used and will use every opportunity to de-stabilized the Progressive Democratic Philippine, however, the root of FREEDOM is too deep to penetrate and stir communism among Filipinos, who are busy with simple life, tabloids, eat bulaga, showtime and other dramas in TV and in actual life. These siestas does not exists in communism.